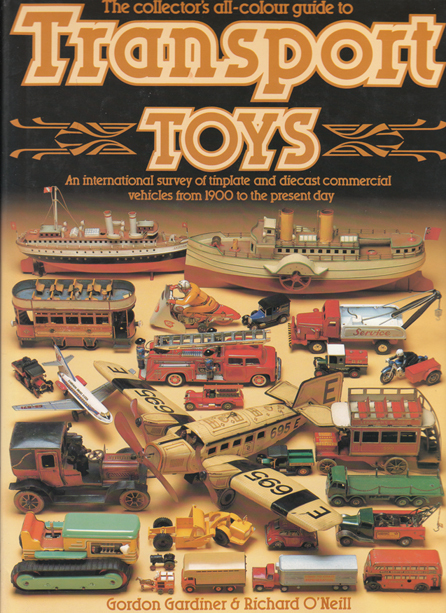 Description: Magnificently illustrated guide to collecting die-cast and tinplate vehicles. Almost 700 examples of commercial and emergency vehicles, sailing vessels, and aircraft produced by such famous names as Dinky, Tri-Ang, and Corgi – plus many others from across the world, including France and Japan. Includes information on the availability of each model, and highlights any rare or unusual versions thereof. Illustrated throughout with stunning full-colour, double-spread photographs. No collector or transport enthusiast should be without this book! Light salmon boards with gilt text on spine. The unclipped jacket (£12.95) has a tiny, closed tear where it meets the head of the spine (only just visible on image) and some light scuffing along the top. Pages are in superb condition throughout: crisp, clean, bright, and tightly bound. Measures 30 cm × 22 cm (12″ × 8.8″). Large 4to. 128 pp.